This one I have made before, and it is a show stopper. I prefer to add a few maple wood chips to my charcoal and cook the bacon outside rather than in the oven the way that Tide and Thyme originally made it. I had my first taste of beer-candied bacon on a burger at my other favorite local brewpub, Evolution’s Public House. While I don’t really remember anything remarkable about the burger itself, that beer-candied bacon really resonated with me. And, I tucked it away in the “make sure to try at home” file. 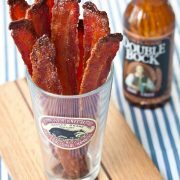 So, when I went into bacon-hoarding overdrive during the Holidays – and had about three pound in the fridge after Christmas, I decided to give the beer-candied bacon thing a go to have for New Year’s Eve munching. Takes less than 1 minute to throw the glaze together, then some cooking time in the oven. Which, by the way, if you haven’t been cooking bacon in your oven you’re missing out. No grease splatter, no bacon sticking to the pan, no more uneven cooking. Just perfectly crisp bacon, every time. If you line a baking pan with aluminum foil, it’s super-easy cleanup too! With the playoff games ahead of us, as well as Super Bowl, these sweet and salty little bites of heaven would “drop the bomb” on anyone who tried them. I served them in my favorite pint glass (yes, that’s a honey badger) which I thought was cute. 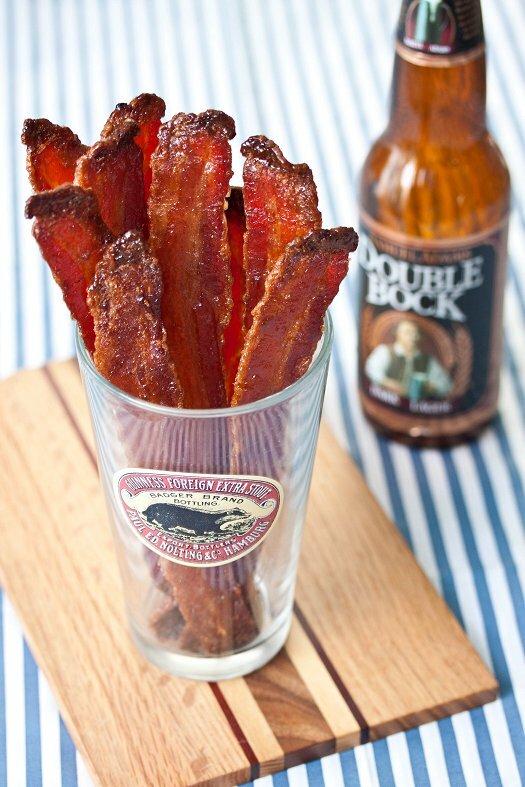 It was almost like a bouquet of bacon; there’s an idea for Valentine’s Day, ladies! I used a stout for the glaze, but I think that most beers (maybe aside from an IPA) would work for this application. It’s a quick and easy appetizer that’s so fun and different – a great start to the new year in my book! Preheat oven to 400 degrees. Combine brown sugar and beer in a small bowl, whisking well to form a thin syrup. Set aside. Line a rimmed baking sheet with aluminum foil. Place a wire cooling rack on top. Place the pieces of bacon on top of the rack, overlapping if necessary. Place in oven and cook for 10 minutes. Remove from oven and brush one side of the bacon with the beer syrup. Flip, and coat the other side with the syrup as well. Return to oven and cook for 10 minutes. Remove from oven, and repeat process another time or two more, until bacon is crispy and browned, and you’ve used all the glaze. Cool on wire rack for at least 1 hour before serving. A Cowboy Breakfast- Beef Sticky Buns!